Those that follow our blog know that we are not afraid to tackle the BIG issues. For our first blog of the year we are going to be talking sauce! Not just any sauce, but the brown variety. Today the papers have announced that sales of brown sauce are taking a dramatic decline (about 19%). For over 100 years the unlikely mix of dates, tamarind and vinegar has graced the tables of greasy spoons across the nation. Although, it has never managed to take off anywhere else in the world. HP, perhaps the nations favourite, sauce was created in 1895 by Nottingham grocer Frederick Gibson Garton, who claimed it was being served at the Houses of Parliament. However, the recipe has far more ancient roots dating back to the Romans when it was served as an accompaniment to oysters. GB sauce are firm favourites with not just because the launched at the British Family Fayre 2013 but because everything in their increasing range of sauces is FANTASTIC, and their brown sauce is no exception. Subtly spiced and with a very natural flavour they use only the very best ingredients… and it shows. They are quickly winning over foodie fans across the nation. They are currently stocked in Sainsburys and a 330g bottle will set you back £2.00. Some people love Stokes sauces but I personally struggle with a weird ‘plasticity’ that exists across all of their range, including the chutneys. It is hard to describe but I am simply not a big fan. Their brown sauce suffers worst of all from this odd ‘mouth feel’, in my opinion. I would love to be more positive, and would love to hear your differing opinions, but I just do not like it. That being said Stokes sauces are really popular and very widely stocked. 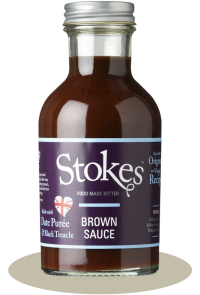 A 320g bottle of Stokes brown is priced £3.10. 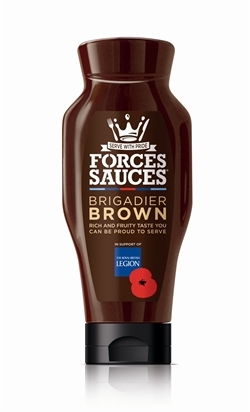 The major USP for this sauce is that fact that it supports those that have formally served in the British Armed Forces with their profits. A truly great cause. However, what is the sauce like? Well, pretty darn good actually. The one thing I would say about this sauce is that it is really spicy! This is great on occasion but sometimes it is a little too much for me. If you like a fiery sauce then this is the one to get. We bought ours from Waitrose but I know that other supermarkets also stock it. At £3.80 for a 500ml bottle it is rather expensive too. The Tiptree Brown sauce is sweeter than the others on this list and sweeter even than HP. That being said it is still a really great sauce that has a very natural flavour. One more thing is that the Tiptree comes out a little thinner than I like personally but that does not stop it being a regular on our breakfast table. Wilkin & Sons stock in various supermarkets including Waitrose and costs £2.00 for 310g. There, you have it. A quick review of just some of the Brown sauces still made in the UK. If you have tried any others please do let us know in the comments section below. We’re big fans of Great British Sauce having bought our first bottle of tomato at the 2013 British family fair. Now we’re hooked on their smoky barbecue sauce – if you haven’t tried it do. It perks up everything! I can’t comment on the taste of any of these sauces, but I feel you have been slightly misleading by saying the Forces one is rather expensive. If you work out the cost per 100g then you find that Stokes is relatively expensive and the others are comparably priced. Will have to try some now! You are quite right Chris. Well spotted! Wikipedia states that Branston Sauce is still made in Bury St Edmunds but that was a couple of years back – and it is owned by the Japanese. Great shame that HP is no longer made here. Why not? We can make sauce as well as the Dutch. Breaks my heart. No more HP for me. You are correct Branston is still produced in the UK. The only ‘mainstream’ brand to be. A version of brown sauce is popular in Japan. 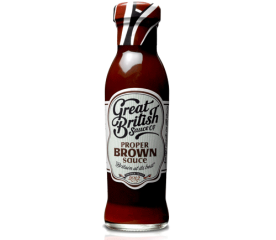 Geo Watkins – makers of the very British mushroom ketchup make a brown sauce. I have no idea if it’s made in the UK but it is a Kentish company. I’ve voted. My husband believes their brown sauce is the best he has ever tasted. I bought the first bottle at an exhibition, only wish I’d bought more! trouble is we can’t seem to find a supplier in Bristol. Our Sainsburys doesn’t stock it. Hummmm, yes that is a shame. I just did a store location search on their website and there seems to be 7 stores (Asda and Sainsburys) that stock in the Bristol area! I’m a big fan of the Stokes Brown Sauce and their Ketchup and I can not say I have noticed the plasticity you seem to feel, I have not tried the GBS Propper Brown as I can not get it locally but I do like the Smokey BBQ Sauce which I can get in my local Sainsbury’s and that is very nice indeed, and unfortunately the I agree with you about the Tiptree Sauce being way too thin it used to have a great viscosity but over the last 18 month or so they must have changed the recipe and as for the Forces Sauce I think it tastes great but unfortunately it has a very bad effect on my IBS so it is a no go for me. Thanks for another great set of reviews of British produce keep up the good work guys. 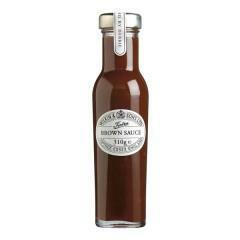 I think Wilkin & Sons LTD Brown Sauce is sickly sweet and taste of nothing but sugar! Opened a bottle today and shall probably bin it!